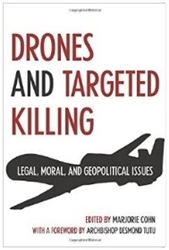 It’s the book: “Drones and Targeted Killing: Legal, Moral, and Geopolitical Issues”, edited by Marjorie Cohn, with a Foreword by Archbishop Desmond Tutu. all for a $75 donation to WBAI radio that you make at the URL above. Feel free to re-broadcast, and please let me know if you do.